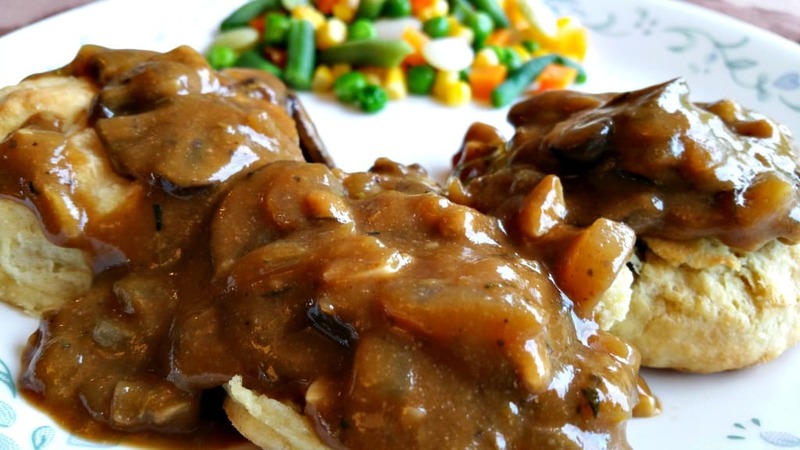 This Vegan Mushroom Gravy is pure gravy heaven. I mean there’s just something magical about gravy …..isn’t there? Maybe it’s the memories of mom walking me down to the corner grill before school for a big ‘ole plate of biscuits and gravy. Or maybe it’s the beef manhattans smothered in rich brown gravy that is near and dear to my heart. But then there was the chicken fried steak in Texas with all that creamy white gravy…..
Gravy just seems to make food more…..well – comforting. So last night when my daughter asked for some of my Fluffy Buttermilk Biscuits…… I just knew I had to make some gravy to go with. And since I had just brought home a new package of my favorite Baby Bella Mushrooms, it only made sense to try and make some kitchen magic happen. I can definitely see a lot more of this gravy in my future (and my belly)! Start out with an 8oz container of your favorite mushrooms. I like Baby Bellas, but even the white button mushrooms would work too. Saute about half an onion and 3-4 cloves of minced garlic in a few tablespoons of white wine. Once the veggies are nice and soft go ahead and add the mushrooms. Add 2 tablespoons of soy sauce (I always use the low sodium variety) and simmer until they’ve reduced in size and released all their liquid. Meanwhile in a separate pan, lightly heat about 1/4 cup of whole wheat flour, a tablespoon of nutritional yeast and 1/2 teaspoon each of thyme, rubbed sage, and rosemary. You don’t want to burn this, just heat it until it smells nice and toasty, and then stir this into your mushrooms. Stir well and slowly add 2 1/4 cups of low sodium veggie broth. Make sure all the flour has dissolved and add 1/2 teaspoon of Kitchen Bouquet Browning Sauce. I also added just a drop of liquid smoke, but this is completely optional. Heat this until it starts to bubble, and then just wait for it to reach the consistency you like. The longer you heat it the thicker it will become. This will make the perfect gravy for those ‘fancy’ occasions, or just as a weekday topper to all those yummy baked potatoes us McDougallers eat. Now don’t just stand there in front of the stove eating spoonfuls out of the pan…… go pour this on something! A rich, decadent vegan mushroom gravy perfect for those special occasions, or just as a daily topper for potatoes, biscuits, or rice. Vegan and fat free. Would any GF flours sub OK with this? cornstarch…the amount might not be quite the same, but cornstarch is a good thickener. Would this be okay without the Kitchen Bouquet Browning & Seasoning Sauce?? 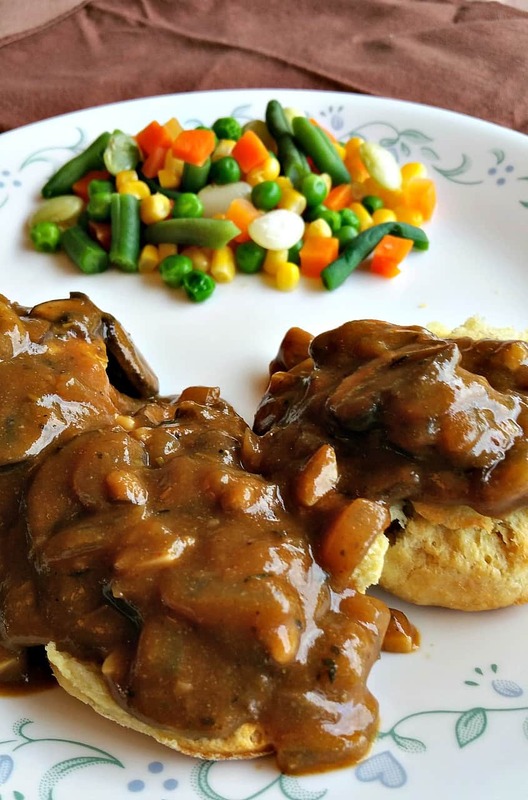 We’ve tried several vegan mushroom gravy recipes and this is by far and away the BEST. Thank you!!! This looks good. I’ve done other mushroom gravies and they are always bland. I’m not a huge gravy fan, but today I got a hankering for some. 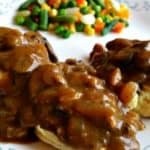 I made your (easy peasy) mushroom gravy, ladled some on my lentil loaf (Lynn’s Meatloaf) and mashed potatoes and . . . . suddenly I’m a huge gravy fan! This recipe is a keeper. Good stuff! I have been wanting to try this recipe for quite a while and finally did tonight. I didn’t have white wine, so used a couple splashes of red wine vinegar. It turned out delicious – even my picky husband loved it. Thank you for this. I looked at several other recipes that had either white flour or corn starch. Much prefer the flavor and health of ww flour and nutra yeast. Subbed red wine for white. All the rest the same and it’s lovely! Had to stop just eating it by the spoonful! Thank you, it was amazing. Didn’t have kitchen bouquet, thought it looked nice and brown without it. This recipe is fabulous! I omitted the last 2 ingredients because I didn’t have the browning sauce and do not like liquid smoke. I have a Brown Gravy – delicious and probably everyone’s favorite. I also have a mushroom gravy (also very good) and a country style cream gravy for biscuits and gravy. Omg! Amazing. Putting this on everything! Lol. I modified slightly. Used mushroom broth Vice water. Used three types mushrooms. Splash of Braggs aminos. YUM. Thanks much for your creative food! This was fantastic! Used mushroom broth, omitted browning sauce, and red wine. I used my cheese sauce – once. Other than that I used various salsas and hot-sauces, or sauerkraut and mustard. I made this last night for (a non-vegan) Thanksgiving dinner, and everyone kept raving about it! I even skipped the part of browning the flour because my stovetop was full, haha. Thanks for this great recipe Chuck!